The frictions excited by the antics of Philippine President Rodrigo Duterte have caused even greater heat over the last few days, with calls for the departure of US special forces operating in Mindanao. Having already made it clear to Washington that he intends pursuing “an independent foreign policy,” he has now insisted that the general root of ills in instability lie in the troublesome, headache causing alliance with the United States. Nothing could stand in greater contrast to such sentiment than the pact of 2014 signed between Manila and Washington, a confirmation of all the ills Duterte despises. While that agreement did not countenance the reopening of US bases in the Philippines, something that would have had a constitutional hurdle to climb, it permitted roving and near unlimited US access to military bases across the country. Despite the pretence of being severed from the US umbilical cord in 1946, the neo-colonial aftertaste has remained. From 2002 to 2013, $441 million in security funding was provided to Manila. The Obama administration had set aside a hefty $120 million in military aid for 2016. As Senator Miriam Defensor-Santiago, chairman of the Philippines Senate Committee on Foreign Affairs explained with the signatures on the agreement barely dry, the agreement was of limited value to the country, while being splendid for US interests. This would, in effect, convert Manila into a compliant satellite to Washington’s goals in the Asia-Pacific. As if to emphasise that point, both states had agreed earlier this year to the deployment of thousands of American troops to five Philippine bases, measures that are hardly accidental given the spike in tensions in the South China Sea. The boisterous Duterte, a vastly different creature from Benigno Aquino III, has issued directives to his defence secretary to seek military supplies from China and Russia rather than US sources. “I want weaponry and armaments…. 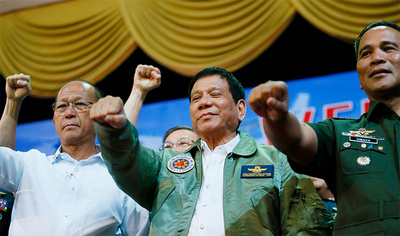 We don’t need F16 jets, that is of no use to us.” Jets were useless in counter-insurgency operations in the Philippines; far better stick, he suggested, to “propeller-driven planes”. Such moves are not suggestive of a total distancing from the United States; Duterte is evidently keen to widen his appeal to other powers, rather than clinging on the tired assumption that all that stems from Washington is somehow good. On that level, the politics is sound, an attempt to defuse a confrontation that risks involving China and the US in a regional punch-up. On Tuesday, Duterte also explained that the Philippines would cease patrolling the South China Sea alongside the US Navy. What was less extensively reported by US media outlets is that he would prefer Filipino forces to be doing their own patrolling up to 12 nautical miles offshore, rather than having entanglements with either US or Chinese forces. The old myopic view that Duterte is merely the resident buffoon and brute is delightfully simple, but one that has currency in the corridors of US power. It holds that he is an aberration, that his legacy will pass, and that his views are of no consequence. US officials persist doing this at their peril, attempting to place Manila, by proxy, in line of Beijing’s ire. The point that has been missed is that this entire revision has been stewing for some time. It has bubbled with fury, bypassing the traditional, submissive structures of power that have favoured an imperial influence for all too long. The point to see will be whether Duterte’s legacy persists in its indignation and redirection, or fizzles in the great power game.